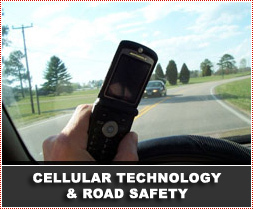 The dangers of cellular phones to road safety are well debated and documented. It is an offence to hold and use a cellphone or other electronic communication device such as BlackBerry, Personal Digital Assistant (PDA) etc whilst driving. The only defense for a person charged with this offence would be where the driver has made a genuine emergency call when it would have been unsafe to stop driving to make the call. It must be kept in mind that the driver's first responsibility is the safe operation of the vehicle. A driver may be charged if erratic driving or a collision results from inattention, regardless of what else may be going on. The risks posed by the cellular phones emanate from the distraction of thinking about the conversation, not only the distraction of physically handling or looking at the device. Unlike CD players or other distractions such as eating or drinking, communications technologies require a driver to cognitively interact with the device, often for long periods of time. The use of cognitive functions can diminish the ability to focus on the task of driving. Research suggests that stressful, emotional or important conversations are even more distracting to the driver. Phones are much more sophisticated than they were a decade ago. Modern mobile phones can take, send and receive pictures. They allow users to surf the Web, check stock quotes and sports scores, play video games and perform a variety of additional functions beyond conversation. Cellular technology has changed the lives of all road users. It is impossible to consider a life without our cellular phones. Business people faced with increased traffic congestion have a greater incentive to use their phones and other wireless technologies to make the extra time spent in their cars more productive. The ability to call emergency services as a means of security for lone drivers, or to access weather or traffic information. Cell phones are a valuable safety device. Information about an accident can be communicated accurately and speedily. A driver can drive without stress as he knows that help is only a phone call away. This helps him keep his peace of mind and the roads safer. Cellphones gives people reassurance in knowing that if you are in an emergency situation you can call for help immediately and through emergency service numbers you know who to call for help. For many, cellphones have become a mobile panic button providing peace of mind. Drivers can report crimes in progress or other potentially life-threatening emergencies, accidents, or drunk driving. It is estimated that in the US more than 200,000 emergency calls are placed on wireless phones every day. The value lies in having the phone available in the car, not in having the phone turned on. The safety feature comes from the ability to make an outgoing call in an emergency. When reporting an emergency situation, it's best to pull over so that your vehicle isn't posing a risk to others and so that you can adequately report the details and answer any questions. This is much more difficult to do while navigating a vehicle through traffic. End conversations immediately if driving conditions or situations become hazardous (for example, inclement weather, roadway construction, high-speed or high-volume traffic). - Be alert to situations on the road where a cellphone's radio frequency and electronics may be potentially harmful such as: construction zones where blasting is occurring, or at petrol stations/fuelling areas. A cellular phone is a responsibility and a privilege. People need to learn how to use it safely to maximize the benefits. Cellular providers are encouraged to promote safe cell phone use through education and training. The cellular industry worldwide has developed a variety of cell phone safety guides providing safe-driving tips and explaining how to report emergencies. It is imperative that adequate awareness be created amongst cell phone users to help them recognise hazards that could lead to accidents, disabilities and deaths and thus avoid these mishaps. Several wireless service providers and automobile manufacturers have launched campaigns to improve awareness of the risks of driver inattention. These campaigns include public service announcements, brochures as well as the promotion of safety through radio ads and other media. Cellular providers in South Africa assist in providing many benefits to road users through education and guidance about these benefits and safety aspects. Personal safety is a key factor for many South Africans. In an emergency situation, the ability to make an immediate phone call to an emergency service number to request assistance can and has meant the difference between life and death to thousands of people. Vodacom, South Africa’s leading cellular network, provides its customers with various Emergency services that address safety and security needs and assist in saving countless lives. Some of the options Vodacom provides in terms of security are Look4me and Look4Help which we explain in more detail below. Look4me is a service that is very helpful in finding out where loved ones are and if they're safe, exclusively available to Vodacom customers. Look4me allows Vodacom customers to track other Vodacom customers via their cellphone, provided consent was granted. To use Look4me, the customer (user) pays a monthly subscription fee and a transaction fee for every search performed. Look4Help is another service to which all Vodacom customers may subscribe. By setting up four cell numbers of family and friends, the customer can trigger an SMS alert, which sends out a distress message with their location to the four pre-specified cell numbers in an emergency situation. Saving the Look4Help number as a speed dial extends the customer's cellphone to a mobile panic button. When the speed dial number is dialled in an emergency, the selected recipients are informed of the sender's location - they are notified that the sender is in an emergency situation and can try to contact him/her, physically come to their rescue or contact an emergency service to assist. Vodacom customers are charged a monthly subscription and a transaction fee for every time the speed dial number is dialled. Location services are intended to compliment, not be a substitute for, parental supervision. However, in conjunction with other types of communication, such as phoning or texting, they can help parents keep in touch with their children. Free medical transportation by road or air after any medical emergency anywhere in South Africa. Free telephonic emergency medical information and advice service. Free trauma counselling service is also available for free 24 hours a day. 112 Emergency Service is available to all Vodacom customers. By dialling 112 from a Vodacom cellphone, you will be connected by the operator to the closest public emergency service, including the police, traffic, ambulance service and fire department closest to your location. The operator will obtain information from the customer to determine their location, after which the customer will be connected to the most appropriate and closest emergency service. It is important for customers to hold on the line until they are connected to the emergency service requested. With the information provided by the customer to the emergency services, the most appropriate cause of action will be taken. Dialling 112 from a Vodacom cellphone in an emergency situation allows the customer to be connected to their closest emergency service for response. All calls to this number are free of charge. The 147 Emergency Service provides additional emergency support, information and value added services to all Vodacom customers. The operator of the 147 call centre will stay on line with the customer in an emergency situation and make sure that the call is successfully routed to the police, fire brigade, ambulance, traffic, medical and/or roadside assistance services. Standard call rates apply. Vodacom customers have the option to subscribe to the “147 Plus” service and pay a fixed monthly fee. This provides the customer with free medical assistance, including a 24 hour medical advice helpline, as well as 24 hour emergency-medical advice and information hotline 24 hours per day. Free medical transportation and other free medical services are also included. The “147 Peace-of-mind service”, charged at a monthly subscription fee is also an option. This services includes all the value added services provided as per the “147 Plus” service. In addition, customers also get free roadside assistance when needing help with a flat tyre, flat battery, even when a customer has been in a car accident they will provide vehicle assistance. This service also provides a home service programme for emergency situations, access to legal and tax experts with the as well as worldwide travel assistance access programme. ICE (In Case of Emergency) is an international concept which allows emergency service personnel to obtain the contact information of family or friends of a person in an emergency situation, through accessing “ICE” on the person’s cellphone address book. With ICE, paramedics will be able to notify your family or friends immediately, by accessing your information, rather than going through an entire address book guessing who to phone. Paramedics know what ICE means and they look for it straight away. Conference calling allows you to connect with up to five other people at the same time. All participants in a Conference Call can talk to the other participants and hear each other clearly. It is useful for conducting meetings telephonically or to communicate with a group of people at the same time. Road users who are lost and needing help reaching their destination will benefit from this service. Anywhere in SA, 24 hours a day, 7 days a week MTN Directions 22522 will be on hand just dial 22522. This is a service for publicly listed numbers and is available 24 hours, 7 days a week. Dial 200 and speak to the operator. For Call Connect, ask the operator to connect you to the number of your choice. This service is available 24 hours, 7 days a week, i.e. a crisis centre for police, ambulance, fire brigade and a poison centre. 112 calls are routed directly to MRI (Medical Rescue International) which operates throughout SA. Calls to 112 are free of charge. This provides a reliable wakeup call and might assist the road users in planning his trip and avoiding the dangers of speeding when not on time!